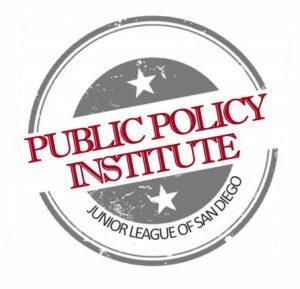 The Junior League of San Diego’s Public Policy Institute is a unique training experience aimed at educating members on nonprofit advocacy. Our guest speakers will include legislators and staff, community leaders, nonprofit organizations and league leadership.As we advance further into our focus area, understanding nonprofit advocacy and how nonprofit organizations work becomes increasingly important. We want everyone in the San Diego community to feel empowered to advocate on the issues they believe in. The Public Policy Institute will consist of five evening trainings, which will cover a number of topics including general nonprofit advocacy education, as well as appointments to city, county, and state government boards. Additional opportunities for participants will include Day at City Hall and Day at the State Capitol.